UN figures indicate that Bangladesh, a state once identified with natural catastrophes and rock-concert relief, is on the cusp of its demographic window (reflected in its age structure, shown in Figure 1, below)—a period of favorable age structures that researchers associate with an increased pace of development and a more stable political future. Bangladesh is already a solid member of the World Bank’s lower middle-income class. According to a set of statistical models that we have developed, by 2030 Bangladesh appears to have an even chance of reaching the Bank’s upper middle-income class (roughly US$4,000 to $12,000 per capita annually). For a country that Henry Kissinger famously dubbed “a basket case” at independence in 1971, that prospect is impressive. 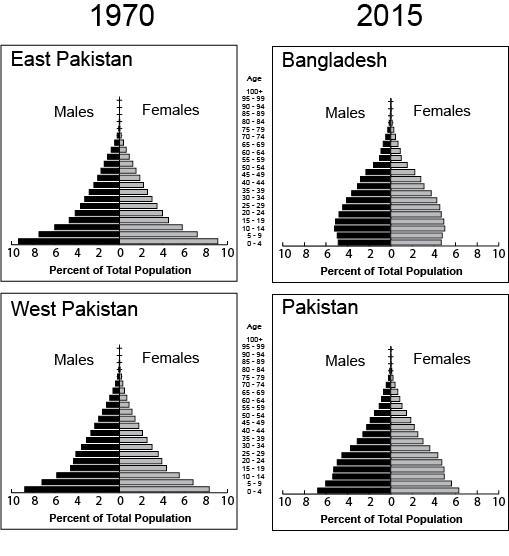 Comparison of age structures, 1970 & 2015, following Bangladesh’s secession in 1971: East Pakistan Provincial Wing becomes Bangladesh; West Pakistan Provincial Wing becomes Pakistan. This remarkable turnaround is not a big surprise to international health specialists. In 1975, the government in Dhaka began collaborating with the International Centre for Diarrheal Disease Research, Bangladesh (ICDDR/B) to initiate a program of community-based contraceptive distribution in Matlab subdistrict, a long-term health and demographic surveillance site. Click here to read the rest of … “Bangladesh & Pakistan: Demographic Twins Grow Apart” on the New Security Beat, or download the .pdf here.